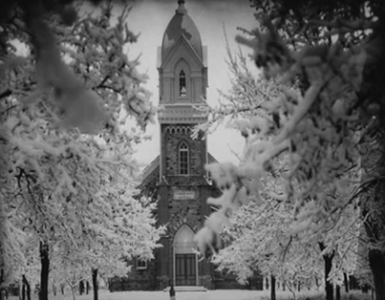 Although the area which now encompasses Brigham City had long been an intermittent home to bands of Shoshone Indians, and been crossed by explorers, trappers and mountain men, it was not settled in an organized manner until the arrival of Mormon pioneers in 1851. Almost immediately after the early pioneers arrived in the Salt Lake Valley in 1847, Brigham Young sent parties to explore and colonize areas he envisioned as part of a great Mormon territory inclusive of what are now the states of Utah and Nevada, as well as parts of Arizona, California, and Idaho. On August 9, 1847, a four-man exploration party led by Jesse C. Little was sent north to Cache Valley. His report to Brigham Young describes traveling north to the Bear River and turning east into Cache Valley, then returning through the mountains along Box Elder Creek during the party’s week-long journey.1.Jesse C. Little, “Journal,” 47, MS, cited on Milton R. Hunter, “Brigham Young the Colonizer”, (Salt Lake City: Deseret News Press, 1940), 34. By 1849, two Box Elder settlers were on record: Orrin Porter Rockwell, who built a cabin near a spring surrounded by meadowlands at what is now known as Porter Spring in Perry, and Lyman Wells in North Willow Creek, now known as Willard.David N. Morrell, “From Then Until Now 1851-2008”, (Brigham City: Brigham City, Utah, Stake of the Church of Jesus Christ of Latter-day Saints, 2008), 1. There are at least three versions of who first visited Box Elder in the fall of 1850. A family history lists only William Davis as that visitor. The History of Box Elder Stake, published in 1977 in commemoration of the 100th anniversary of the creation of the stake, states, “William Davis and Simeon Carter had done some plowing and cabin construction at Box Elder the fall of 1850.”Vaughn Nielsen, “The History of Box Elder Stake, Church of Jesus Christ of Latter Day Saints”, (Brigham City: Box Elder Stake, 1977), 1 Other accounts credit three men — William Davis, James Brooks, and Thomas Peirce (Pierce) — with traveling as far north as Box Elder Creek, which they explored west from the mouth of the canyon to determine the best place for a camp. 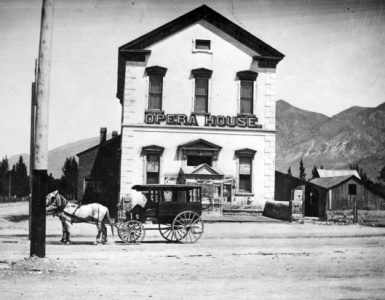 Whichever account is accurate, the site chosen was located in what is now the northwest part of Brigham City. Box elder, cottonwood, willow trees, and berry bushes bordered the clear-flowing creek. Deer, a variety of game birds, and fish were abundant in the surrounding area. A turn or two of the plow showed fertile soil. LDS historians officially agree that William Davis, James Brooks, and Thomas Peirce arrived March 11, 1851, on Box Elder Creek at the future site of Brigham City, with the Box Elder Stake history noting: “to find the building begun the previous fall destroyed by the Indians, but a plow hidden by Simeon Carter, unmolested.”Ibid., 1. The new settlers cut trees to build mud-chinked log cabins with roofs of smaller branches, willows, and rushes, topped with sod cut from the river bank. The original three families were soon joined by other families, among them Simeon Carter, who had heeded the call to move north. They were cautioned to keep close together for safety until agreements were made with Indians in the territory. The resources that made the site attractive to pioneers had made it a well-used habitat by a band of Shoshone Indians, numbered at about 500 during this period. Before they built cabins, the first order of business was to assign plots and to plant crops for the year’s harvest. All land in Utah became part of the public domain when the United States signed the Treaty of Guadalupe Hidalgo in February 1848.Division of Archives and Records Service,” Original Land Titles in Utah”, (Salt Lake City, Utah State Government, 2012, last updated in April 2003). By law, no public land could be disposed of until it had been officially surveyed, although Brigham Young’s plan was to grant rather than offer it for sale. “Brigham Young intended to populate the territory as rapidly as possible, and from the start declared that “no man should buy land…but every man should have his land measured off to him for city and farming purposes, what he could till.”Ibid, based on “Laws and Ordinances of the State of Deseret (Utah) Compilation 1851”. (Salt Lake City, Shepard Book Company, 1919).